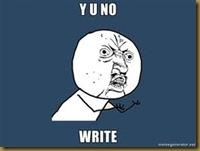 Literary Coldcuts on Toasty Buns » Blog Archive » Y is for Y U NO WRITE? 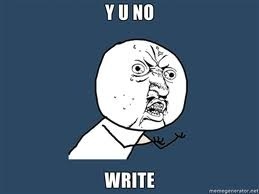 Y is for Y U NO WRITE? I haven’t put pen to paper for the past month or so (beyond quick revisions here and there), and that’s not acceptable. There’s a story a day challenge coming up in May too… anyone interested? I don’t know that I’ll officially participate, but I plan to use it as inspiration. Anyone else feeling the lack of writing time these days, or is it just me? This entry was posted on Friday, April 29th, 2011 at 3:54 pm	and is filed under Everything Else. You can follow any responses to this entry through the RSS 2.0 feed. You can leave a response, or trackback from your own site. I feel there is just a general lack of anything at the moment. April showers really got to me, and I feel completely brain-dead still a month later. Let’s hope June brings some good vibes and inspiration. For everyone’s sake.